I am a big, big fan when it comes to the Alien universe. I even have a soft spot for Fincher’s work with Alien 3. That’s what made me so excited for a chance to take a look at Gearbox’s attempt at the franchise with Aliens: Colonial Marines. The Gearbox rep leading the demo explained what we’d be seeing before dimming the lights and starting the game. 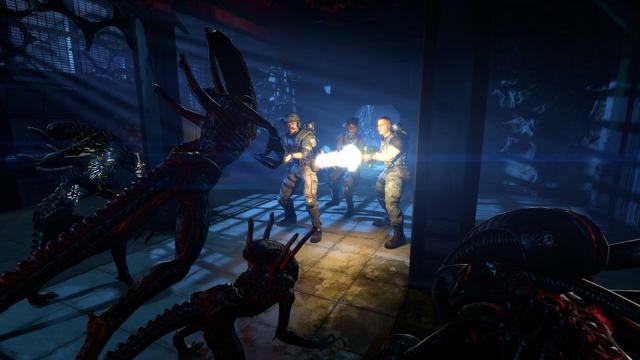 Colonial Marines takes place 17 weeks after the events of Aliens on the Sulaco (the space ship). The colonial marines are responding to a distress beacon on the ship when the title opens up. Gearbox’s stance on this game is that they hope to affect the cannon so much that Alien 3 actually becomes a better movie. That means the plot, and hopefully the holes it fills, will be deeply rooted in Alien lore. The demo opened up and, immediately, the game looked great. Gearbox actually worked with Ridley Scott (director of the original film) and Syd Mead (the famed concept artist who actually designed the Sulaco) in order to build their game with as much accuracy to the films as possible. That means the interior of the ship and the places infested with xenomorphs looked spot-on and completely in line with the Alien universe. Sound effects and assets all worked in the same way, as well. The guns, for instance, have a very, very distinct sound in Aliens. Those are back and they sound the same. The motion sensor is in the game, too. That’s a particularly creepy mechanic as players can either have the motion sensor out or their weapon, not both at once. It’s also worth highlighting that Gearbox seems to be doing well so far with the pacing of this title. Alien flicks are meant to start slow and methodical before they ramp up into terror and action. The onset of this title works in mostly the same way. There are a few mishaps that keep the action rolling before the climax, but the game mostly plays in a slow and creepy vibe during the first few minutes. 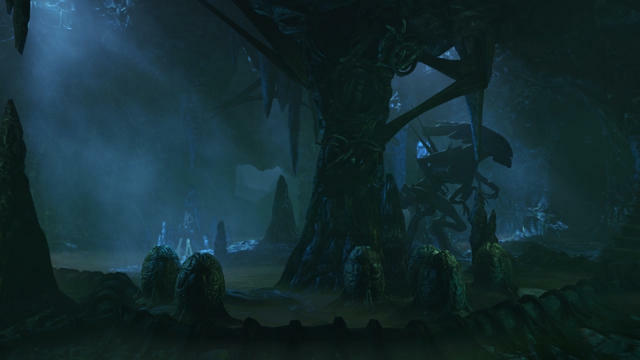 That could all fall apart once the full experience is launched, but, right now, it looks like Gearbox is working to accurately pace this tale of terror. The one thing that did make me cringe came during moments of bigger combat. The xenomorphs (the nerd name for the aliens) look great when they’re crawling on walls, hanging from ceilings or popping out of the deck of the ship. When they approach the player, however, they all take to standing on two legs and engaging in the same swipe animation. As this happens, and it may change in time for release, the player sees a group of now goofy looking xenomorphs all doing the same silly attack. For a game that otherwise completely nails pacing, atmosphere and dread, this whole thing sticks out like crazy. But, as I said, this was a demo. The game still has a good bit of time left between now and its planned release. Aliens: Colonial Marines is currently set to release some time this fall for the Xbox 360, PlayStation 3, PC and Wii U platforms.